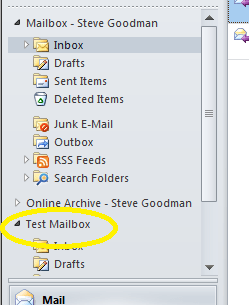 The next time Outlook 2010 or Outlook 2007 launches they searches for mailboxes that have the user’s mailbox DN listed and displays them below the user’s primary mailbox. 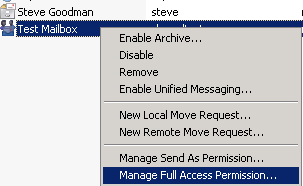 In previous versions this was accomplished by going to the user’s Exchange accounts settings, going to “More Settings”, choosing “Advanced” and entering the shared mailbox manually under “Open these additional mailboxes” as shown below. For any organisation making use of a large number of shared mailboxes this is a bit of a pain as IT needs to both write documentation so users can do this themselves and in many cases do it for the user. The new feature simply removes this step. The catch (!) is that just moving a shared mailbox to SP1 or upgrading isn’t enough to enable the feature. 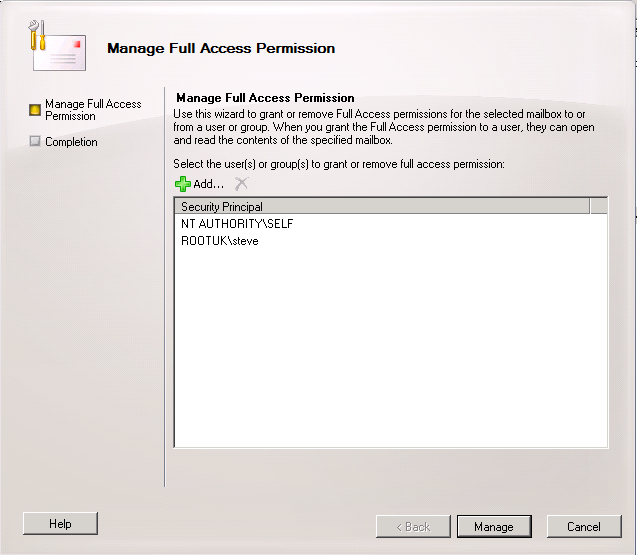 As it’s an extra attribute added at the same time as the permissions, you need to remove and re-add the permissions via the normal way (EMC or Powershell’s Remove-MailboxPermission/Add-MailboxPermission) to make this take effect, or do it yourself via ADSI scripting/AD Powershell (probably not very supported!). Yes, it’s really that simple. Simple enough that you might use it without even noticing and wonder how that shared mailbox got mapped in the first place.. But I think it’s definitely going to be a feature any IT department that routinely adds/removes permissions for mailboxes this way will appreciate. I’ve had a lot of comments from people who don’t want this to happen all the time. If this is you, the check out my other article Disable Exchange 2010 SP1′s Auto Shared Mailbox Mapping Feature. Solution for me was very simple. Forget about the ADSI stuff. Just re-add the proxy mailbox that you can’t seem to get rid of. -Go to outlook–>file–>account settings–>more setting and add. -Once you add it, close the Outlook. – Go exchange, remove your permission to the mailbox. The process that you describe here works perfectly and is very simple. THANK YOU!!!! I do not really like to add every single user to a shared mailbox (I required a lot of them) and like to work with groups like we have done with Public Folders in past. But if I use a group the shared mailbox does not appear in Outlook!? Any idea how we are able to accomplish this automatic add/remove of mailboxes in Outlook with group memberships? Hello, is there a way then ot make the primary mailbox hidden, so all that is left is the shared mailbox? An article that actually describes the nuts and bolts of AutoDiscovery – this has helped me solve why some users didnt auto connect to shared mailboxes – but that leadds on to what is happening with our replication with AD / Exchange !!!?!?! Thanks a lot, I was looking on how to disable autoMapping and found it in your other article. Surprised nobody has mentioned the fundamental stupidity of the function, Auto mapping is nice for normal user, but outlook client has to traverse EVERY mail enabled user in the domain to find the attribute on the TARGET mailbox. Absolutley stupid resource hungry process. What happens if there are 100 000 users, as in some education environments? The attribute, and search, should on the users own properties only. Guess developers have no real life experience. Bill please come back! Yes, but wouldn’t that just be a one-time process? Haha, yeah, that’s not how this works. At all. First, Outlook has no clue about this attribute. It gets the list of linked mailboxes from the Autodiscover response. It does not go scouring through the AD for linked mailboxes. The list in the Autodiscover response comes from one simple property on the mailbox: msExchDelegateListBL. 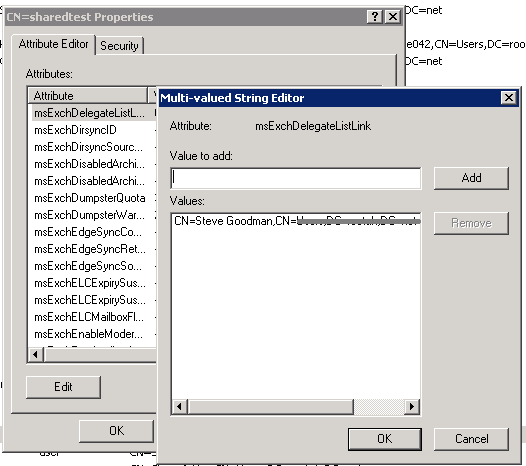 The msExchDelegateListLink is a linked attribute. On the shared mailbox, it’s the “forward” link, and it links to the “backlink” attribute on the mailbox that has permissions to the shared mailbox. So, as soon as the link is populated on the shared mailbox, the backlink is populated automatically by the Active Directory. Thus, all Exchange has to do is read one property on the mailbox to find out all the mailboxes it needs to add to the Autodiscover response. Since you’re querying a GC for a DN-linked value, this is not a very expensive query. You could even mark the attribute for indexing to make it super fast (like proxy address lookups). Thus, this feature is not resource hungry at all, and even if there was no backlink, it still wouldn’t be resource hungry. +1 Yep, as Bill says! Jonathan, you’ve got a little mixed up. Refer http://technet.microsoft.com/en-us/library/hh529943(v=exchg.141).aspx, Microsoft acknowledges a performance hit. The Attribute (MsExchDelegateListLink) is written on the GRANTING mailbox, so Autodiscovery (or any discovery process) has to parse EVERY User/Mailbox (Attribute) to find this. As adding or removing values from MsExchDelegateListLink changes Outlooks behaviour on every launch, Autodiscovery is happening every time Outlook is opened. What I cannot find is where the attribute AlternateMailbox actually exists, do you know where it is Bill/Steve? This attribute must also be user specific. The current environment I am working in has over 40,000 AD users (I have worked in bigger), so not trivial. Flat domain structure was recommended by Microsoft with the release of Server 2008, even the largest environments I have worked in now follow this. The fact the attribute is in the Global catalogue makes no difference? The simple solution would be to write the attribute (and discover from) the Mailbox/user who is GRANTED rights, i.e. check 1 attribute regardless of environment size. Outlook opening times is a common complaint I have from users (multiple environments), though load time seem to a be a bit random. And Mark, no it is not a 1 time function, it is done every time Outlook opens (has to, to allow for changing permissions). Easy to test just by Writing the MsExchDelegateListLink attribute. Steve probably has a script that will do this (or would be easy to modify) or use ADSI edit. The Attribute MsExchDelegateListLink has no effect on security or access, so if it is there Outlook will try to open the mailbox. It was quite common for the attribute not to be removed after removing permissions, or not to add the attribute when adding permissions, this appears to have been fixed now? Why check 40,000 entries instead of 1? Or is my idea just dumb? You guys are really stretching my memory, my original post was almost a year ago! Jonathan, as I mentioned, that is not the way it works. The performance hit the article describes has nothing to do with looking at this attribute on a zillion mailboxes. The attribute that lists the mailboxes where you’ve been granted rights is already there. I mentioned it on my first reply. Again, msExchDelegateListLink is the forward link. msExchDelegateListBL is the backlink. For example, let’s say you have a mailbox named Jonathan. I go to a mailbox named Bill and I set msExchDelegateListLink to point to Jonathan. Active Directory automatically populates msExchDelegateListBL on Jonathan with the DN of Bill (you can test this in ADSI Edit if you like). Now, when Jonathan performs Autodiscover, Exchange simply reads msExchDelegateListLink from Jonathan and returns those values in the Autodiscover response. Outlook calls Autodiscover, Autodiscover reads msExchDelegateListBL from your mailbox. Done. There’s no scouring the AD for msExchDelegateListLink. Oh, and in answer to your question about AlternateMailbox, that’s the part of the Autodiscover response that lists the mailboxes from msExchDelegateListBL. It’s actually AlternativeMailbox, though. They spelled it wrong in the article. Bill the problem I have is that I do not see the attribute “msExchDelegateListBL”, is there a version when this was introduced? We are currently running Exchange 2010 SP1. Autodiscovery and opening mail boxes is working OK. My mailbox/user has access to 3 mailboxes and no attribute “msExchDelegateListBL” or anything close? Attribute “msExchDelegateListLink” is easy to find. AD is 2008 R2 fully patched. Exchange is going to be SPed in next couple of weeks. This is a different environment from when I wrote my original post…but same behavior? Where in AD is the attribute written? Found the attribute in SP2 documentation, so looks like you are right for SP2 onwards, SP1 behaves pretty much as I described, so I guess somebody at Microsoft recognized the problem before me and fixed it with SP2. This attribute was always there from the start. This was never the performance issue. The performance issue the article is talking about is what happens whenever you add several additional mailboxes to Outlook by any method. It doesn’t have to be automapping. You can go into the profile, go to “Open these additional mailboxes”, and add some mailboxes there, and you’ll experience the same performance issue. It’s the issue that comes with opening several additional mailboxes by any method, regardless of automapping. The problem with automapping is that, unlike additional mailboxes in the profile, you couldn’t take the mailboxes out of the profile. There was no way to stop Outlook from opening them (aside from removing the permissions), which was why it was such an issue. Bill you are right, I had to turn on “backlinks” in ADSI edit 🙂 Documentation shows these were added to Exchange 2007 with SP2, total brain fade on my part. As a note these attributes can also be viewed from ADUC in advanced mode…which also needs the option “backlinks” selected. Excellent items from you, man. I’ve bear in mind your stuff prior to and you’re just too great. I really like what you have acquired right here, certainly like what you’re stating and the best way wherein you assert it. You are making it enjoyable and you still care for to keep it wise. I can not wait to learn much more from you. That is actually a great website. such info a lot. I was looking for this certain info for a long time.